(Phys.org) —Graphene foams have been around now for a couple years. Their widespread application in everything from electronics and energy storage to substitutes for helium in balloons is still greatly anticipated. Researchers from the Chinese Academy of Sciences in Suzhou, and Beijing, have now shown that graphene foams can also be used to craft conductive scaffolds for neural stem cells. Their open paper, published yesterday in Nature's Scientific Reports, suggests new approaches for neural tissue engineering, and possibly for interfacing with neural prosthetics. It has been previously reported that graphene sheets support growth and differentiation of human neural stem cells (NSCs) in a similar fashion to other common substrates like glass or polymer PDMS. Chinese researchers have done pioneering work in synthesizing graphene foams to exacting standards of purity and uniformity. 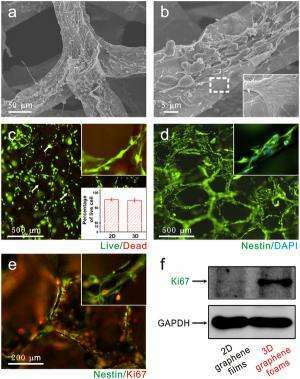 When coated with laminin or other matrix proteins, these foams could potentially serve not only as compatible neural housing but also as a means to control the tenants electrically. To probe the electrical characteristics of the foam the researchers used cyclic voltammetry, a common technique often used in basic electrochemistry. Their results indicated that the cells could be safely stimulated via capacitive charge injection in the potential window range from -0.2 to + 0.8 V, similar again to results from 2D graphene film studies. They further noted that the 3D foam architecture provides more efficient charge injection and potentially more specific stimulation capability. It is instructive here to note that our painful collective history with asbestos fiber has shown us that geometry can make the poison as much as any chemical effect. It is not just the aspect of the asbestos fiber, but its inconvenient scale that makes its presence so insidious within the lung. Similarly the researchers did not expect to just toss a few neurons onto a random trusswork and expect the ladder's rungs to be ideally spaced. Indeed the images provided by the authors show the seeded NSCs clinging to the graphene structure like spacewalking astronauts trawling along a space station—but somehow they not only survived, but seemed to thrive. 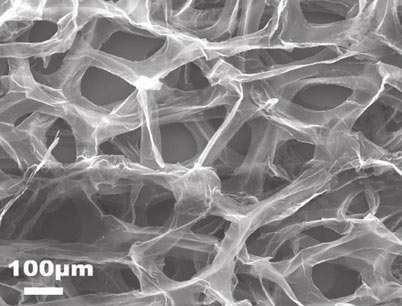 The graphene foams were synthesized by chemical vapor deposition using a Ni foam template. Scanning electron microscope observation showed a porous structure, which was determined to average 100-300um while the graphene skeleton width was around 100-200um. The surface chemistry of the graphene foams was characterized the X-ray photoelectron spectroscopy (XPS). The criteria used to gauge inertness of the surface was the presence of a large peak corresponding to non-oxygenated rings and small peaks for the C-O bonds. Cytotoxicity, evaluated using Calcein-AM and EthD-I staining, showed that 90% of the cells were viable at 5 days out. Proliferation of NSCs was measured from the expression of Ki-67 protein, a marker for cell proliferation that is absent during interphase, and was initially expressed in 80% of the cells. After 5 days, the cells exhibited elongated cell shape with neurite outgrowth, and covered the entire foam surface to confluence. Tuj-1-postive neurons, O4-positive oligodendrocytes, and GFAP-positive astrocytes were all observed in healy abundance. The longer term clinical scenario for these kinds of studies is still unfolding. In the absence of vascularization, neurons can only bear to have so many neighbors nearby, and still receive adequate nourishment through diffusion. The traditional concept of using degradable matrices that would be later implanted into the cortex has yet to be realized. Chemical enticements to integrate with the local neuritic field and vasculature are just beginning to be explored for these kinds of explant studies. Permanent matrices with functionalized surfaces that would also be electrically addressable would be a welcome addition to this toolkit. Real cortical gray matter is a jungle where ceaseless competition for every cubic nanometer of space is not just a game of survival, it is the lifeblood of every thought and memory. If you were to imagine wrestlers in a steel cage match, packed to hilt, you would not be too far off. Every electromechanical spike, every mini-potential produced in a dendrite, is a breath. A little extra bit of power upon inhalation to exert upon competitors held in mutual death-grip, only to have it ever so tightened again after each exhalation. Successful introduction of novice and metabolically disadvantaged tissue into this strategic landscape would require certain considerations on its behalf. Extra stimulation, growth factor, or oxygenation might be just what it takes to ensure productive evolution of new structure. Another final take-home message of the paper suggests is that some level of editorial patience must have been afforded for the many obvious grammatical missteps and outright phraseological foibles understandably introduced by the Chinese authorship. It is a small price to pay perhaps for our mutual collaboration. It is encouraging that Western journals welcome the continued publication of Chinese advances in fields like graphene processing, along with the efforts of the authors taken to make it understandable to us. Neural stem cell (NSC) based therapy provides a promising approach for neural regeneration. For the success of NSC clinical application, a scaffold is required to provide three-dimensional (3D) cell growth microenvironments and appropriate synergistic cell guidance cues. Here, we report the first utilization of graphene foam, a 3D porous structure, as a novel scaffold for NSCs in vitro. It was found that three-dimensional graphene foams (3D-GFs) can not only support NSC growth, but also keep cell at an active proliferation state with upregulation of Ki67 expression than that of two-dimensional graphene films. Meanwhile, phenotypic analysis indicated that 3D-GFs can enhance the NSC differentiation towards astrocytes and especially neurons. Furthermore, a good electrical coupling of 3D-GFs with differentiated NSCs for efficient electrical stimulation was observed. Our findings implicate 3D-GFs could offer a powerful platform for NSC research, neural tissue engineering and neural prostheses.